Despite a large number of studies on tick biology, there is limited information on long-term changes in tick populations. This study thus aimed to assess the long-term population dynamics of questing ixodid ticks in two landscape zones of the Kruger National Park (KNP). Questing ixodid ticks were collected in the KNP from August 1988 to March 2002 by monthly dragging of the vegetation in three habitats (grassland, woodland and gully) at two sites (Nhlowa Road and Skukuza). Findings pertaining to total tick numbers and Amblyomma hebraeum and Rhipicephalus decoloratus specifically are presented here. Fourteen tick species were collected, as well as four others that could be identified only to generic level. More ticks (211 569 vs 125 810) were collected at Nhlowa Road than at Skukuza. Larvae were the most commonly collected stage of all the major tick species. A. hebraeum was the most commonly collected tick (63.6%) at Nhlowa Road, whereas R.decoloratus accounted for 15.3% of the ticks collected there. At Skukuza, 31.6% and 27.1% of the collected ticks were R. decoloratus and A. hebraeum respectively. Most A. hebraeum larvae were collected in summer and the fewest in winter and early spring, mostly in woodland and least often in grassland habitats. Most R. decoloratus larvae were collected in spring and the fewest in autumn and winter, and were more frequently collected in woodland and grassland than in gullies. The largest collections of most tick species were made during the early 1990s, while numbers were lowest in the mid-1990s after a drought during 1991 and 1992 and then increased towards the late 1990s, followed by a final decrease. The changes in tick numbers over time probably reflect differences in their host communities at the two sites and the effect of climatic conditions on both hosts and free-living ticks. The population dynamics of questing ticks reflect a complex interaction between ticks, their hosts and the environment. Tick populations are influenced by a complex interaction between the ticks, their hosts and the environment. There have been many studies regarding the various factors affecting the tick-host-environment association. However, most have been of relatively short duration (typically 1-2 years) and there is little information on longer-term changes in tick populations. 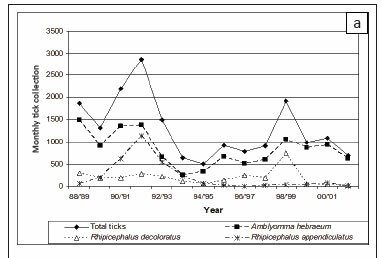 In South Africa, Horak and Boomker (1998) collected ticks from bontebok, (Damaliscus pygargus dorcas) and grey rhebok (Pelea capreolus) in the Bontebok National Park over a 10-year period. While there were marked changes in the abundance of the major tick species over time, the changes are difficult to interpret because the ticks were collected only during February of each year. Horak et al. (1993) and Horak et al. (1995b) monitored the changes in tick populations on scrub hares (Lepus saxatilis) at Skukuza in the Kruger National Park (KNP) monthly over a period of 6 years. Most Amblyomma hebraeum larvae were collected from the hares between November and March or April and an erratic decline in numbers was observed over the 6-year survey period. The numbers of larvae of the two-host tick Hyalomma truncatum peaked on the hares between May and August every year and the nymphs between June and September. No noticeable decline in their numbers was evident during the 6 years of the survey. The KNP, encompassing nearly 2 million hectare, is a large nature reserve in north-eastern South Africa. Acocks (1988) classified five vegetation types in the KNP and at a more detailed level Gertenbach (1983) described 35 landscape zones. Numerous surveys of the ticks parasitising wildlife in the KNP have been conducted (Horak, De Vos & Brown 1983; Horak, De Vos & De Klerk 1984; Horak et al. 1987b; Horak et al. 1988; Horak et al. 1991; Horak et al. 1992; Horak et al. 1993; Horak, De Vos & Braack 1995a; Horak et al. 1995b; Spickett et al. 1995; Braack et al. 1996; Horak et al. 2000a; Horak et al. 2003). These studies have recorded the host associations of tick species, their patterns of seasonal abundance, and the effects of host age and gender and droughts on the intensity of infestation. There have also been various surveys of free-living ticks in the park (Spickett et al. 1992; Horak et al. 2006b). These studies have examined differences among landscape zones and the effects of droughts and burning on free-living tick populations. In the present communication we describe changes in the populations of questing ticks, and specifically of two major species, A. hebraeum and Rhipicephalus decoloratus, collected from the vegetation in two landscape zones in the KNP monthly over a period of 164 months. Preliminary results on five tick species collected during either the first 11 or 12 years of the survey, and on one species collected throughout the survey, have previously been published (Horak, Spickett & Braack 2000b; Horak, Emslie & Spickett 2001; Horak et al. 2006a). The study was conducted at Nhlowa Road and Skukuza in the KNP. The Nhlowa Road site was located in the south of Landscape Zone 17, which has been described as a Sclerocarya caffra-Acacia nigrescens savanna (Gertenbach 1983). This landscape zone extends from the south-eastern border of the KNP to beyond the Satara tourist rest camp, approximately 125 km to the north. It is an open, treed savanna with moderate shrub and dense grass cover (Gertenbach 1983). The study site (approximately 25º15'S, 31º55'E; alt. approximately 200 m above sea level) was about 8 km long and 2 km wide and straddled the Nhlowa gravel tourist road between the Crocodile Bridge tourist rest camp in the south and the Lower Sabie tourist rest camp in the north. The Skukuza site was situated in the central north of Landscape Zone 4, the Thickets of the Sabie and Crocodile Rivers (Gertenbach 1983). This landscape zone extends from the middle of the southern border of the KNP to north of the Skukuza tourist rest camp, a distance of approximately 50 km. The vegetation consists of thorny thickets characterised by A. nigrescens and Combretum apiculatum, with a sparse grass layer (Gertenbach 1983). The site (approximately 25º04'S, 31º32'E; alt. approximately 260 m above sea level) was about 7 km long by 2 km wide and straddled the gravel road serving as a firebreak along the banks of the seasonally flowing Nwaswitshaka River. The site commenced approximately 4 km west of the Skukuza tourist rest camp and continued west to the gravel tourist road that joins the tarred Doispane and Napi roads. The climate in the southern KNP is described as tropical with summer rainfall. Both sites were within the 600 mm - 650 mm isohyets (Gertenbach 1980). Annual rainfall (June-May) at the Skukuza rest camp averaged 609 mm over the period of the study, with a range of 275 mm - 1122 mm (Figure 1a). 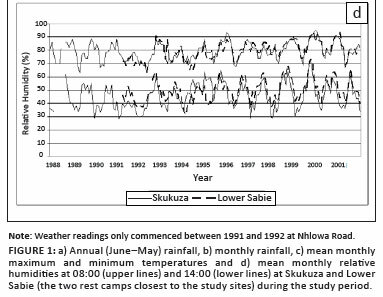 Although the annual rainfall often differed between the two sites in a given year (Figure 1a and 1b), average annual rainfall at the Lower Sabie rest camp (the closest climate station to the Nhlowa Road site) was similar to that at the Skukuza rest camp. Weather readings only commenced at the Lower Sabie rest camp between 1991 and 1992 and rainfall at the Nhlowa site, which was located in Arid Lowveld, was probably lower than that at the Lower Sabie rest camp located in the Lowveld (Acocks 1988). Based on the long-term rainfall patterns in the KNP (Gertenbach 1980; Whyte & Joubert 1988), the study commenced toward the end of a dry cycle that ended in the early 1990s, while the latter part of the study was conducted in a wet cycle. 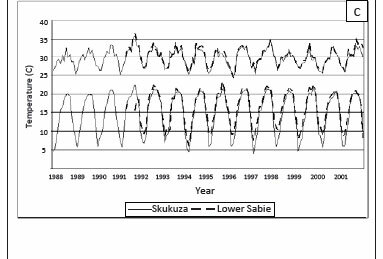 Average temperatures were approximately 0.8 ºC cooler at Skukuza than at Lower Sabie, with maximum temperatures differing by 0.4 ºC and minimum temperatures by 1.3 ºC (Figure 1c). Average relative humidity at the Skukuza rest camp was similar to that at the Lower Sabie rest camp at 08:00 but was generally lower at 14:00 (Figure 1d). Questing ticks were collected by drag-sampling the vegetation with flannel strips (Spickett et al. 1992). In addition to the flannel strips, the operator responsible for dragging the strips also wore flannel leggings. Three drags, each approximately 250 m long and 1 m wide, were performed in each of three habitats at each site, namely grassland, woodland and gully. The three habitats were selected subjectively on their visual appearance. Because of the limited number of gullies at each site, the same gullies were usually sampled every month, whereas the sampling locations in grassland and woodland usually varied from month to month. After each drag the ticks collected on the flannel strips and the leggings were removed using sharp-pointed forceps. Ticks were stored in 70% ethyl alcohol in internally labelled, plastic-stoppered glass vials for subsequent identification and counting. Sampling commenced in August 1988 and continued in every habitat at both localities until March 2002, except after heavy rainfall or during a bush fire, or upon sighting elephants (Loxodonta africana), African buffaloes (Syncerus caffer) or lions (Panthera leo) in a habitat. The tick counts were log10 transformed prior to analysis to reduce the effects of over-dispersion (Petney, Van Ark & Spickett 1990). Independent variables of interest in the analysis were site, year, season, habitat and rainfall. Year was normally taken as the seasonal year (June-May) used to define the annual rainfall in the KNP, unless the occurrence of a tick stage was restricted to a calendar year. When the numbers were sufficient, the seasonality of the total number of ticks and each stage of a species were tested for both sites using serial autocorrelation (SPSS Inc. 1994). Multifactor analyses of variance were used to assess the effect of site, year, season and habitat on the total number of ticks and each stage. When their occurrence was strongly seasonal, months with zero counts were usually excluded to improve the sensitivity of the analysis. A serial cross-correlation was used to assess the relationship between rainfall and tick numbers. The total number of ticks and the respective species collected at each site are summarised in Table 1. Fourteen species were identified, while a further four species could be identified only to generic level. Nine of the species were collected in sufficient numbers to allow an evaluation of trends, while the other five species were collected only infrequently and in small numbers. More ticks were collected at Nhlowa Road than at Skukuza (p < 0.0001). At Nhlowa Road, A.hebraeum accounted for 63.6% of the ticks collected and was the species most commonly collected in all years (Figure 2a). R. appendiculatus (17.3%) and R.decoloratus (15.3%) were the other commonly collected ticks, with R. appendiculatus the second most commonly collected tick between the 1989 and 1994 collection periods and was subsequently replaced by R. decoloratus. 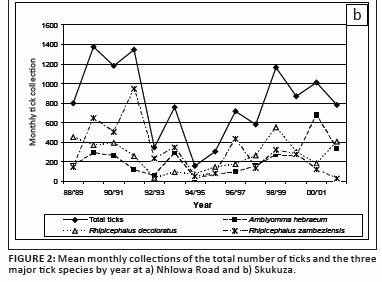 At Skukuza, R. zambeziensis (38.3%) was the most commonly collected tick, followed by R. decoloratus (31.6%) and A. hebraeum (27.1%). R. zambeziensis was the most commonly collected tick between 1989 and 1993 and again in 1998 (Figure 2b). R. decoloratus was the most common species in other years, except in 2000 when A. hebraeum was most commonly collected. All of the commonly collected tick species have regularly been collected from large ungulates in the KNP, mostly as larvae (Horak et al. 1983; Horak et al. 1984; Horak et al. 1988; Horak et al. 1992; Horak et al. 2003; Horak, Golezardy & Uys 2007). The differences in the most common tick species and the numbers of ticks between the two sites probably reflect the differences in the large herbivore assemblages. The open savanna of the Nhlowa Road site is used by white rhinoceroses (Ceratotherium simum), giraffes (Giraffa camelopardalis), African buffaloes, greater kudus (Tragelaphus strepsiceros) Burchell's zebras (Equus burchellii), blue wildebeest (Connochaetes taurinus) and impalas (Aepyceros melampus). Rhinoceroses and giraffes are excellent hosts of adult A. hebraeum and African buffaloes are excellent hosts of adult A. hebraeum and R. appendiculatus (Horak et al. 1987a; Horak et al. 2007). Zebras, kudus and impalas are good hosts of all stages of development of R.decoloratus (Horak et al. 1984; Horak et al. 1992; Horak et al. 2003). The most common ungulates in the thickets of the Skukuza site are impalas, kudus, bushbuck (Tragelaphus scriptus) and giraffes, although black rhinoceroses (Dicerosbicornis), buffaloes and zebras are also present. From 1988 to 1994 the populations of several ungulate species in the KNP, including kudus, warthogs (Phacochoerus africanus) and buffaloes declined by more than 50%. Declines of 20% - 30% were also observed in the populations of other species, such as blue wildebeest and impalas, while the populations of some species, such as zebras and giraffes, did not change significantly (Ogutu & Owen-Smith 2005). For many of the ungulate species that declined, there were significant lags in the population response to changes in rainfall and the recovery of those populations was delayed after the annual rainfall increased, probably because of the increased adult mortality during the years with low rainfall (Owen-Smith & Mason 2005; Owen-Smith, Mason & Ogutu 2005). The ungulate species that declined are important hosts of the major tick species and the delayed recovery of ungulate populations probably contributed to the low tick numbers throughout the latter half of the 1990s, even though the survival of larval ticks should have increased along with the higher rainfall. Changes in the size of the host population have previously been suggested as an explanation for the differences in the number of ticks parasitising impalas in the droughts of 1982 and 1992 in the Skukuza region of the KNP (Horak et al. 1995a; Horak et al. 2003). The impala population was relatively large prior to the drought of 1982, during which 'terminally affected' impalas were more heavily infested with ticks than healthy impalas (Horak et al. 2003). The infestations on healthy impalas in 1982 were similar to those of impalas in 1980, a non-drought year. The impala population declined since the late 1980s and in 1992 tick infestations on impalas were much lower than during the early 1980s. The difference between the trends for 1980 and 1992 were due to the lower numbers of A. hebraeum, R.decoloratus and R. zambeziensis, species for which impalas and kudus are important hosts. 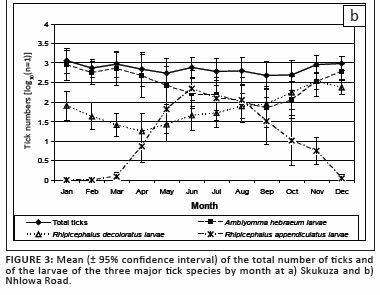 There was significant seasonality in total tick numbers(p < 0.001) at Skukuza (Figure 3a), with a marked decline in tick numbers from January to April and a sharp increase in May. 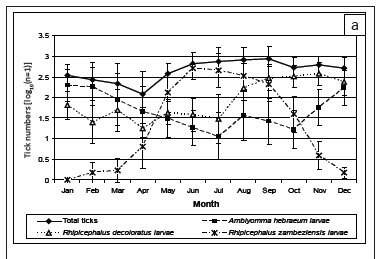 This reflected the seasonal increase in the numbers of R. zambeziensis larvae. 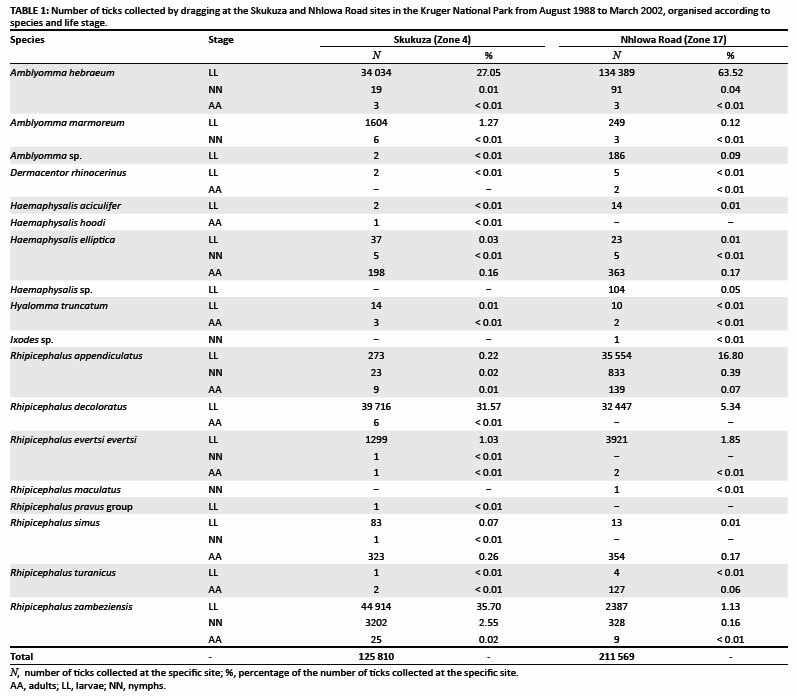 At Nhlowa Road, the seasonal change in tick numbers was not statistically significant (p = 0.2) because the winter decline in the numbers of A. hebraeum larvae was offset by the increases in R. appendiculatus larvae in the winter and R. decoloratus larvae in the spring (Figure 3b). Mean monthly tick collections (June-May) varied significantly between years (p < 0.001) and there was a significant year-by-site interaction (p < 0.001) because the year-to-year changes were not consistent between the two sites (Figure 2a and 2b). However, the highest numbers at both sites occurred in the early 1990s, declined towards the mid-1990s and again increased towards the turn of the century. Annual rainfall declined since 1988, resulting in the drought of 1991, after which it again increased and peaked by 1999. However, tick numbers and rainfall were only weakly correlated, which suggests that annual rainfall was not the primary determinant of the numbers of questing ticks and that changes in ungulate populations over time may also have influenced the observed changes. 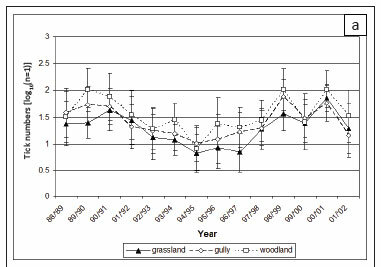 Total tick collections were highest in woodland and lowest in grassland (p < 0.001). This pattern was consistent at both sites (Table 2) and among months and years. The habitat distribution reflects the distribution of A. hebraeum at Nhlowa Road, and of A. hebraeum and R. zambeziensis at Skukuza. Once stimulated, questing A. hebraeum larvae are extremely active and readily climb onto the flannel strips and leggings. Large mammals, such as rhinoceroses, giraffes, buffaloes, elands (Taurotragus oryx) and kudus are important hosts of all stages of this tick, as are warthogs. Smaller antelope, such as impalas, bushbuck and grey duikers (Sylvicapra grimmia), as well as scrub hares, helmeted guinea fowls (Numida meleagris) and carnivores are good hosts of the immature stages (Horak et al. 1987a; Horak et al. 1988; Horak et al. 2007). Larvae and nymphs were more commonly collected at Nhlowa Road than at Skukuza (p < 0.0001). Larvae accounted for more than 99.9% of A. hebraeum collected at both sites. Despite significant variation between years in the mean monthly collections of larvae at the two sites, the trends were similar, with higher numbers in the early 1990s, followed by a decline in the mid-1990s and an increase in the late 1990s (Figure 2a and 2b). 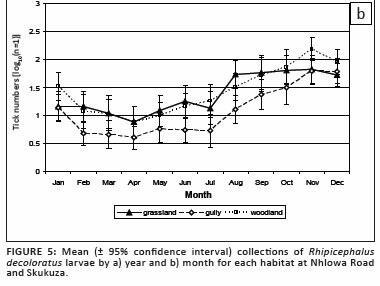 The numbers of A. hebraeum larvae were significantly correlated with annual rainfall during the preceding year (p = 0.02) at Skukuza, but not at Nhlowa Road (p > 0.2). The numbers of collected A. hebraeum nymphs did not differ significantly between years (p = 0.4). The differences between the two sites' tick populations may be explained by the differences in host species. The populations of smaller ungulates, such as impalas, which predominate at Skukuza, appear to respond more rapidly to fluctuations in rainfall (Ogutu & Owen-Smith 2005). The drought during 1991 and 1992 also appeared to have caused the emigration of large mammals from the Skukuza area (Horak et al. 1995a), which would have further exacerbated the impact of declining host populations on the numbers of questing A. hebraeum larvae in this area. After the mid-1990s there was a greater increase in the numbers of A. hebraeum larvae at Skukuza than at Nhlowa Road, as the populations of warthogs and impalas increased after the drought. In contrast, the populations of the larger ungulate species, such as buffaloes and elands, which predominate at the Nhlowa Road site, recovered much slower than the populations of smaller ungulates predominating at Skukuza. A.hebraeum larvae were seasonal at both sites (Figure 3a and 3b; p < 0.001), with numbers peaking in the summer and then reaching a minimum in the winter and early spring. At Skukuza, the lowest numbers were collected in July and did not increase until November, whereas at Nhlowa Road the numbers declined gradually to a nadir in September, then increased. However, the difference in population sizes between the sites was not statistically significant (p = 0.27). Although only small numbers of nymphs were collected, a seasonal pattern was evident at Nhlowa Road (p < 0.05), with a peak in the late summer and early autumn. The peak activity of questing A. hebraeum larvae during the summer rainfall period is consistent with that observed in other summer rainfall areas in southern Africa (Petney et al. 1987). 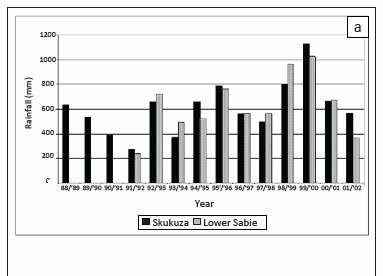 A similar pattern of seasonal activity was observed on scrub hares examined at monthly intervals around Skukuza for the first 6 years of the present survey (Horak et al. 1993; Horak et al. 1995b) and warthogs examined in the southern KNP from 1980 to 1981 (Horak et al. 1988). The intensity of infestation of A. hebraeum larvae appeared to be non-seasonal on greater kudus (Horak et al. 1992). However, on impalas, the seasonal peaks of infestation were in the autumn and spring (Horak et al. 2003), while the peaks on helmeted guinea fowls occurred in the summer and winter (Horak et al. 1991), and on zebras in the winter (Horak et al. 1984). The differences between the seasonal activity of questing A. hebraeum larvae and their seasonal abundance on hosts may be related to a number of factors. The intensity of infestations may differ among individuals of a host species at a given time; thus, the apparent seasonal pattern may depend on the individuals sampled. Also, many of the larger ungulates exhibit seasonal changes in distribution. Even within restricted home ranges, both kudus and impalas appear to shift habitat use seasonally within the KNP (Young 1972; Owen-Smith 1979). These shifts in habitat use may alter the exposure to questing A. hebraeum larvae for mobile species, whereas the intensity of infestation on more sedentary species, such as scrub hares and warthogs, more accurately reflects the activity of questing ticks. According to Petney, Horak and Rechav (1987), A. hebraeum larvae are restricted to well-drained, shaded habitats with grass cover. 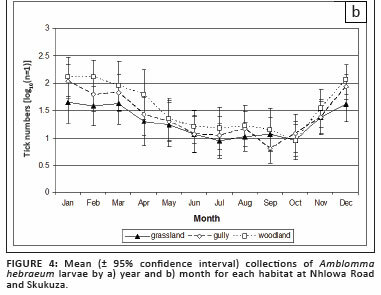 In the present study, larger numbers of A. hebraeum larvae were collected in the woodland than in the grassland (p < 0.001) at both sites (Table 2), and this difference was consistent over years and months (Figure 4a and 4b). Two factors may account for such distribution. Firstly, the large herbivore hosts of adult A. hebraeum are inclined to rest or shelter in the shade of trees during the heat of the day and hence more engorged female ticks may detach there. Engorged female ticks may detach in grassland habitats, but here these extremely large, slow-moving creatures could easily be seen by birds and other predators. Secondly, the higher relative humidity and lower saturation deficits in the woodland and gullies may have increased larval survival. Nymphs were collected mostly in the gullies and least often in the grassland. This tick infests a wide range of ungulate hosts in the KNP and accounted for the majority of ticks collected from blue wildebeest, Burchell's zebra, impalas and greater kudus (Horak et al. 1983; Horak et al. 1984; Horak et al. 1992; Horak et al. 2003). Small to medium-sized intermediate feeders or browsers, such as impalas and greater kudus, appear to support much larger burdens than the grazers (zebras, blue wildebeest and buffaloes) or large browsers such as giraffes (Horak et al. 1983; Horak et al. 1984; Horak et al. 1992; Horak et al. 2003; Horak et al. 2007). More R. decoloratus larvae were collected at Skukuza than at Nhlowa Road (p = 0.004), which may be explained by the predominance of impalas and greater kudus at Skukuza. There was a significant year-to-year variation in the numbers of larvae (p < 0.001) as well as a significant year-by-site interaction (p < 0.001). The numbers at Skukuza were higher than the numbers at Nhlowa Road between 1988 and 1990 (Figure 2a and 2b). The numbers at Skukuza declined rapidly from 1990 to 1992 and remained lower than those at Nhlowa Road from 1992 to 1994. In contrast, the numbers at Nhlowa Road were relatively constant from 1988 to 1991, followed by a decline until 1994. The numbers at both sites increased between 1995 and 1998, followed again by a decline. However, the decline at Skukuza was much less pronounced than at Nhlowa Road. The numbers of R. decoloratus larvae were not significantly correlated with annual rainfall. R. decoloratus was seasonal at both sites (p < 0.001), with the largest collections made in the spring and the smallest in autumn and winter (Figure 3a and 3b). The seasonal pattern differed between the sites (p = 0.048). At Skukuza the numbers remained low from February to July, and then increased sharply to peak during September-November before declining again. At Nhlowa Road, the changes from the nadir in April to the peak in November appeared to be more gradual. Average autumn and winter temperatures at Nhlowa Road were typically 1 ºC - 2 ºC higher than at Skukuza and the effect of winter temperatures may have been less pronounced than at Skukuza. However, the increase in the number of questing larvae over the winter suggests that other factors, such as seasonal shifts in habitat use by host animals may also be important. 10 ºC (Short et al. 1989; Spickett & Heyne 1990). In the Eastern Cape and Gauteng Provinces, South Africa, the majority of eggs are produced by female ticks towards the end of the summer and later, over-winter (Robertson 1981; Spickett & Heyne 1990). As the temperature rises in spring these eggs hatch more or less synchronously (Robertson 1981), giving rise to an increase in questing larvae on the vegetation at this time. The seasonal pattern of R. decoloratus larvae at Skukuza is consistent with the above interpretation, although larvae were active throughout the winter, probably because the average temperature of 16 ºC - 17 ºC for June and July is well above the threshold temperature for development. A second factor that may impact on the seasonal pattern of R. decoloratus is host resistance. At Skukuza and in the Biyamiti region of the KNP, the increase in the intensity of infestation of R. decoloratus on impalas from August (Horak et al. 2003) was similar to the pattern observed for questing ticks at Skukuza. However, the intensity of infestation on impalas declined more rapidly than the numbers of questing ticks. The initial increase in the intensity of infestation on impalas was caused by an increase in larvae numbers. This resulted in a rapid increase in the larvae: adult ratio in August and September (Gallivan & Horak, unpublished observations 2003) because the increase in the infestations of nymphs and adults lagged behind the increase in the infestations of larvae. The larvae: adult ratio declined in October, and in December the intensity of the total R. decoloratus infestation declined, possibly as a result of the development of resistance. The increase in the numbers of R. decoloratus on impalas from August occurred towards the end of the winter when diet quality is reduced (Monro 1980; Van Rooyen 1992) and impalas are in poorer condition (Gallivan, Culverwell & Girdwood 1995). Resistance to tick infestation is reduced on a low plane of nutrition (O'Kelly & Seifert 1969; Sutherst et al. 1983). Thus, impalas were exposed to large numbers of questing R. decoloratus larvae at a time when they had reduced resistance to infestation. The decrease in the larvae: adult ratio in October corresponded to the beginning of the annual rainfall period, which is associated with an improvement in diet quality. Sutherst et al. (1983) have shown that a smaller percentage of R. microplus larvae mature on cattle maintained on a higher plane of nutrition and that the percentage that matures varies seasonally, with a peak in the winter when forage quality is low and a rapid decline in the spring when forage quality improves. The decline in the percentage of R. decoloratus larvae maturing on impalas at Skukuza from October onwards would reduce the number of females detaching and, subsequently, the number of questing larvae in the summer and early autumn. Blue wildebeest and zebras are the predominant species in Landscape Zone 17, and buffaloes, kudus, and giraffes are also present in large numbers (Gertenbach 1983). Blue wildebeest and zebras migrate between the northern and southern parts of Zone 17 annually, moving north in the summer and south in the winter (Gertenbach 1983). Blue wildebeest are poor hosts of ixodid ticks, but Burchell's zebras are relatively efficient hosts (Horak et al. 1983; Horak et al. 1984; Gallivan & Horak 1997) and may harbour burdens of R. decoloratus similar to the burdens on impalas (Horak et al. 1984; Horak et al. 2003). The movement of blue wildebeest and zebras into the Nhlowa Road site during the autumn would increase the number of detaching females and contribute to the increasing numbers of questing larvae during the winter and spring. The northward movement of these host species in the spring would limit the availability of hosts and hence, the numbers of questing larvae. At Skukuza the numbers of questing R. decoloratus larvae declined rapidly following the 1991 drought, but subsequently increased to a peak in 1998. The higher summer temperatures and lower relative humidity during the drought of the early 1990s probably reduced larval survival. In addition, there was a marked reduction in the size of the impala population (Horak et al. 1995a). The combination of reduced larval survival and low host density resulted in a considerable reduction in intensity of infestation on impalas during the 1991 drought (Horak et al. 2003). 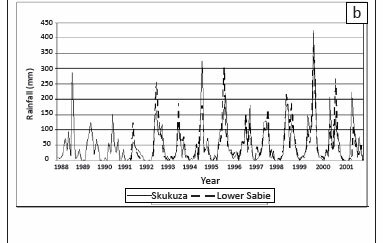 The number of impalas at Skukuza increased again in 1992 (Horak et al. 1995a), but the numbers of questing R. decoloratus larvae remained low until 1994. The delay in the recovery of the population of questing R. decoloratus larvae suggests that even though the impala population recovered, the low intensity of infestation probably limited the number of detaching female ticks. Consequently the population of questing R. decoloratus larvae did not recover until the intensity of infestation increased on impalas and other hosts. The decline in the numbers of questing R. decoloratus larvae at Nhlowa Road following the 1991 drought was more gradual than at Skukuza and the nadir was not reached until 1994. The diversity of large host species at Nhlowa Road may have altered the response. While there were marked decreases in the populations of some hosts (e.g. kudus and buffaloes), the populations of others like giraffes and zebras did not decline (Ogutu & Owen-Smith 2005). Similar to the situation at Skukuza, numbers of R. decoloratus larvae peaked in 1998 at Nhlowa Road. This increase in numbers was apparent from March to June 1998, declined to a nadir in August and then reached a new peak in October. The numbers declined dramatically after November and very few larvae were collected in 1999. The average daily temperatures in the autumn, winter and the early spring of 1998 were approximately 1 ºC above the mean. However, while the development rates and fecundity of R. decoloratus are temperature dependent (Londt 1977; Short et al. 1989), a 1 ºC temperature increase is unlikely to account for a fivefold increase in tick numbers. Instead, a combination of increasing host populations and a dry year may have contributed to the marked increase in the numbers of questing R. decoloratus larvae. The recovery of ungulate populations following a population decline may take several years, depending on the fecundity of the species. In the KNP, the recovery of the populations of mid-size ungulates, such as impalas and kudus, appears to require about 5 years (Ogutu & Owen-Smith 2005) and increases in populations are associated with an increase in juvenile survival (Owen-Smith & Mason 2005). Juvenile impalas harbour higher burdens of R. decoloratus than adults (Horak et al. 2003), while juvenile kudus harbour similar burdens to the adults (Horak et al. 1992). 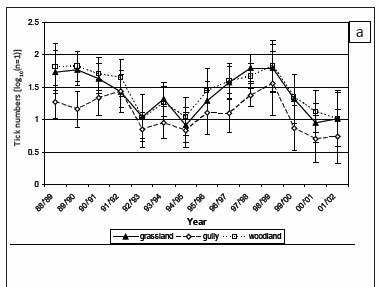 The increase in ungulate populations following the 1991 drought would have coincided with a dry summer and winter during 1997 and 1998 and again during 1998 and 1999 (Figure 1b). In 1998 rainfall at Lower Sabie was only 64 mm from February to August, whereas the mean from 1993 to 2001 was 290 mm. The dry weather from the latter half of the summer throughout the winter probably created significant nutritional stress, a factor which reduces resistance to infestation and which has a greater effect on juveniles than adult animals (Gallivan et al. 1995). Thus the increase in the ungulate populations during 1998 and 1999 with a higher proportion of juveniles, which may have higher intensities of infestation than adults and can be more susceptible to nutritional stress, resulted in a host population of which a large proportion had a reduced resistance to infestation. The combination of a large number of susceptible hosts and more rapid development of the free-living stages probably contributed to a rapid increase in the numbers of questing R. decoloratus larvae. Interestingly, the numbers of questing larvae declined dramatically in December 1998, following more than twice the average rainfall being recorded than in October and November. More R. decoloratus larvae were collected in the woodland and grassland than in the gullies (p < 0.001). This difference was significant at Nhlowa Road, but not at Skukuza (Table 2). The differences among habitats were consistent over years and months (Figure 5a and 5b). General: Despite its lengthy time frame, this study provides information only on trends in tick populations, firstly because sampling by dragging flannel cloths collects mostly only ticks that quest for hosts from the vegetation. Nymphs and adults of A. hebraeum hunt for hosts from the soil surface (Bryson et al. 2000), while the larvae quest for hosts from the vegetation. The substantial difference between the number of collected larvae, and nymphs and adults (Table 1) is an indication of the differences in their host-finding strategies. Because R. decoloratus is a one-host tick, only its larvae seek for hosts, doing so by questing from the vegetation. The numbers of R. decoloratus larvae collected from flannel cloths are thus a better representation of the tick population seeking hosts than is the case with A. hebraeum. Secondly, only a small proportion of the total area of each collection locality was sampled. The nine 250 m2 drag samples conducted each month are equivalent to a total of only 2 250 m2 at each site. The Skukuza site covered 7 km x 2 km (14 000 000 m2) and the Nhlowa Road site covered 8 km x 2 km (16 000 000 m2). Consequently sampling covered only 0.014% - 0.016% of the area at each site. Extrapolating from the drags to the whole site yields changes in the magnitude of millions for the major tick species. From 1989 to 1994 the decline in numbers at Skukuza was equivalent to 1200 ticks per month or 14 400 ticks per year. Extrapolating to the whole site, this represents a decline of 90 million ticks of which only a miniscule fraction was collected by drag-sampling the vegetation. The objective of the study was to assess the long-term population dynamics of questing ixodid ticks in two landscape zones of the KNP and to this end collections were made monthly from the vegetation over a period of 164 months. This paper dealt with changes in the populations of questing larvae and nymphs of A. hebraeum and larvae of R. decoloratus. Changes in the populations of the two ticks were related to rainfall, season, host populations, and their own biology. The study indicated that meaningful results on the seasonality of tick species, of which one or more stages quest for hosts from the vegetation, can be obtained by drag-sampling. It also highlighted the advantages of long-term surveys as opposed to those of shorter duration. This study contributes to the current understanding of the complexity of the population dynamics of these tick species, both of which are of considerable economic importance. We are indebted to the South African National Parks (SANParks) for placing their staff and facilities in the KNP at our disposal. We gratefully acknowledge the assistance of Dr Leo Braack and Mr André Potgieter with arranging the logistics for the collections. Ms Heloise Heyne and Ms Andrea van Niekerk assisted with many of the field collections, as did a number of nature conservation and veterinary students. Our special thanks, however, are reserved for the SANParks staff at Skukuza, who were our armed guards and assisted with the collection of the many thousands of ticks from the flannel strips and leggings. The research was funded by the Faculty of Veterinary Science (University of Pretoria) SANParks, Bayer Animal Health, the University of the Free State and the National Research Foundation. Van Rooyen, A.F., 1992, 'Diets of impala and nyala in two game reserves in Natal, South Africa', South African Journal of Wildlife Research 22, 98-101.